Silvie Granatelli has been a full time studio potter working in Floyd Co. Virginia since 1982. Silvie received a B.F.A. from the Kansas City Art Institute in 1971 and an M.F.A. from Montana State in Bozeman, Montana. She has taught ceramics at Virginia Tech and Berea College in Berea, Kentucky. Her work is in the collection of the Mint Museum in Charlotte, NC, The Museum of Ceramic Art in Alfred, New York, and the Taubman Museum of Art in Roanoke, Virginia. 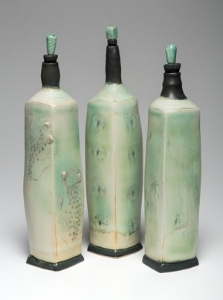 Silvie’s work has been featured in many publications, including Ceramics Monthly, Clay Times, and Studio Potter. Her work can also be found numerous books. These include Pots in the Kitchen, by Josie Walter, The Ceramic Glaze Handbook, by Mark Burleson, and Handbuilt Tableware, by Kathy Triplett. She was the recipient of the Virginia Museum Fellowship Grant in 1995. Throughout her career Silvie has given workshops across the United States. In 2000, she presented a slide lecture in New Delhi, India. In 2003, she participated in a ceramic symposium and show in Izmir, Turkey. Silvie traveled to Tuscany, Italy in 2005. There she teamed up with and Italian chef to teach a workshop on the cuisine and pottery of Tuscany. My pottery is made of porcelain clay. Most of it is wheel thrown and altered. While some pieces have figurative elements, all of my work is glazed and decorated to enhance visual and tactile contrasts. I fire my pots in a gas kiln to cone ten.